Forgotten Peace examines Colombian society’s attempt to move beyond the Western Hemisphere’s worst mid-century conflict and shows how that effort molded notions of belonging and understandings of the past. Robert A. Karl reconstructs encounters between government officials, rural peoples, provincial elites, and urban intellectuals during a crucial conjuncture that saw reformist optimism transform into alienation. In addition to offering a sweeping reinterpretation of Colombian history—including the most detailed account of the origins of the FARC insurgency in any language—Karl provides a Colombian vantage on global processes of democratic transition, development, and memory formation in the 1950s and 1960s. 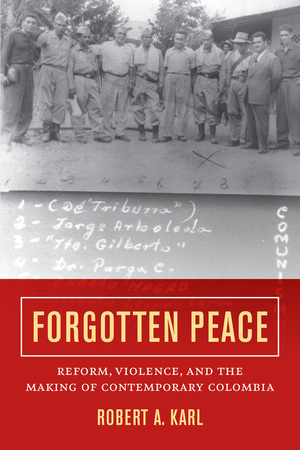 Broad in scope, Forgotten Peace challenges contemporary theories of violence in Latin America. Robert A. Karl is Assistant Professor of History at Princeton University.